Drivers these days are always on the go. In the mornings, between rushing through the drive-thru for our first cup of coffee, up until the end of the day as we sit in static traffic, we’re always multi-tasking with those around us. Everybody knows that driving and texting don’t mix, but nevertheless, we want to be in contact, even if we’re behind the wheel. That’s where Volkswagen’s technologically-savvy new system called Car-Net App Connect comes into play. Always ahead of the trends and consistently focusing on user-experience, Volkswagen has introduced a new way to connect the driver to their vehicle. Use your voice, your fingertips and App Connect’s powerful processor to maintain this connection. With our handheld devices being so integral to our personal and professional lives and our daily commutes becoming longer and more vehicle dependent, App Connect is VW’s way of keeping drivers safely connected while on the road. 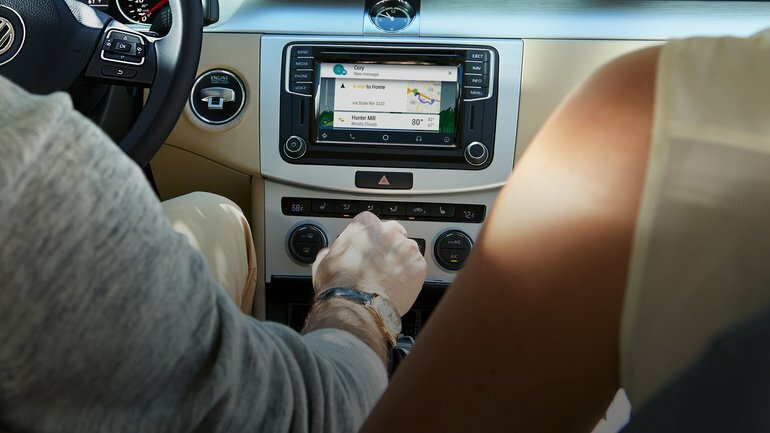 Hands-free and compatible with both Android Auto, Apple CarPlay and MirrorLink, the App Connect system brings you the multimedia experience you’ve grown to expect from today’s modern vehicles. Displayed on a selection of stunning, full-colour touchscreens, your media, contacts, messages and a navigational system are brought to life. Connecting to the system is easy, simply use a USB cable to connect your smartphone and mirror your phone’s interface on the in-car display. Once you’re connected, you’ll find that the new and improved interface is much simpler to navigate than VW’s earlier iteration of the same technology. Volkswagen has said goodbye to lengthy menus, hidden options and convoluted file trees and instead, welcomed a sleeker, user-friendly system. While you have access to a range of media mediums from popular apps such as Spotify, Apple Music and Podcast, Apple users will be happy to know that they can access Apple Maps, while Android uses explore the world through the Google Maps app. Whatever you’re familiar with using can be seamlessly integrated into your Volkswagen’s memory for a flawless, communication-friendly driving experience. VW Car-Net App Connect is available on most models, including a wide range of 2017 and 2018 vehicles. The improved functionality of Car-Net App Connect means that while you have seamless access to the touchscreen, you can also use the power of your voice to dictate messages in the myriad of communications apps available. Think of App Connect as that old friend in the passenger’s side, who’s there to guide you at every turn. Whether you need access to mapping and navigation systems, security or emergency service alerts, that new Justin Bieber song on the radio, or to simply send a quick text to your loved ones, App Connect lets you do it safely and systematically, all under one platform. Hands-free, clearly visible and created for enhanced driver experience, the App Connect system brings the world to your VW.